Worst ... Feet ... Ever! (right foot 4 days after the race) Note to self: No-tears baby shampoo does not prevent tears in adults. 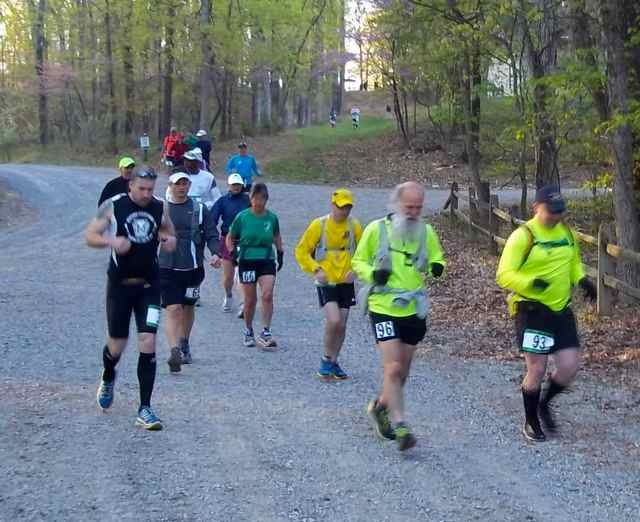 The C&O Canal 100 Miler is my third attempt at that distance — and like the previous two such (2010-05-15 - Half Massanutten Mountain Trails and 2012-04-07 - Philly 100 Endurance Run) it ends with a DNF (Did Not Finish) a little past the halfway point. This time the killer factors are feet. Besides big fluid-filled pillows, my soles turn into hamburger, bruised so that I'm walking like Grandpa McCoy (as played by Walter Brennan) in the 1950s sitcom "The Real McCoys". Almost more painful, at mile 45 when that thought bubbles up, the theme song of that show gets stuck in my head for the remainder of the race. Arggghhhh! The next day I puncture the big sac at the front of the left foot and release ~5 cc of fluid. The corresponding cushion on the right foot has spontaneously broken and flattened out. Underneath the calluses there are other blisters, less evident. The bruises are worst on the right heel; the left heel seems mostly ok. Note to self: When you get a rock or sand in a shoe, take it out sooner rather than later. As the proverb goes, beware of races where the Sun is going to lap you. On Monday morning, two days after the DNF, I'm walking like a 75-year-old with arthritis. That's much much better than on Sunday when I was more like a 95-year-old. I do a net-present-value calculation in my head to decide whether it's worth taking the last ice cube, since that would require a walk between refrigerator and sink to refill the tray and then a walk back. Why did my feet betray me? Perhaps I should have trained on surfaces comparable to that of the towpath, and at a walking pace that matched what I maintained during the race. Perhaps gaiters and thicker socks would have made a difference. But enough kvetching! The C&O Canal 100 is a fine event, well-organized and with super-helpful volunteers at all the aid stations. Overall it's enjoyable, a huge learning experience. Maybe next time I'll get a bit farther? DS Merle kindly rises at 4am and drives me out to Camp Manidokan near Harpers Ferry. We stop on the way at the Knoxville/Brunswick mini-mart (a Sheetz) for munchies. Nineteen hours later Merle picks me up, arriving with perfect timing within 3 minutes of my arrival at the halfway point. Thanks, Son! 4:19am: heading up to C&O Canal 100 miler start - tnx to DS Merle for driving me! 10:21am: C&O Canal mile 12.5 avg 16 min/mi - trekking DFL with comrade Marshall - great conversation! 7:18pm: Keep Tryst aid station - mile 45.5 - feet not good - will see if I can make it to halfway point - sorry, fans! (photo by Bill Susa near the start — the last point that both of my feet leave the ground) Note to self: Thank goodness for grab bars in shower post-race. At the end, during the final steep climb back to Camp Manidokan, huge kudos to volunteer Bill Susa. He pretends to be doing something else as he cheerfully follows me up the hillside and makes sure I get safely back to the Start/Finish area. His kind company is quite welcome at that point. One memorable Porterfield quote: "Ultrarunners are Ultrapeople" — meaning they're ultra-NICE people! And then there's Marshall's First Rule of Feet: "If they're hurting, don't look at them!" Before the race we chat. Marshall has forgotten to bring a watch, so I lend him mine. He suffers from knee problems during and after the 2013-04-13 - Bull Run Run 2013 a fortnight ago, where dear friend Stephanie Fonda and I first meet him. So today Marshall cruises at a brisk ~15 min/mi walk all day. I catch up with him at mile ~1 and thereafter stick with him as much as possible. As darkness begins to fall Marshall realizes that he has left his headlamp and flashlight at his Camp Manidokan drop bag. I offer to lend him one of mine, but instead at the Keep Tryst aid station, mile ~45, he sensibly decides to call it a day before the sun sets. I sit next to him and ponder the options as I eat some vegan soup with noodles that helpful volunteers have given us. Then I foolishly try to continue onward alone. Perhaps the Final Rule of Ultra Club should be: "You do NOT talk about Intestinal Incidents!" — but sometimes rules must be bent, especially if there are lessons to be learned from what happened to me about mile 33. Fortunately I carry several paper towels, and there are no other runners or hikers nearby. A welcome portajohn appears within the next mile and after a brief wait I get my turn. Thankfully, it's well-stocked with toilet paper. The next aid station offers wet-wipes, a few of which I take with me into a nearby latrine. They sting the bum and do the trick. All day along the towpath I meet hikers with bibs that say "ODH", with subscripts "50k" or "100k". After much fruitless speculation I finally ask, and learn that ODH means One Day Hike, a Sierra-Club-sponsored activity. The 50k people start at Whites Ferry, the 100k in DC at the Georgetown mile 0 origin of the C&O Canal towpath. All of them proceed into Harpers Ferry and a couple of miles up the hill there to finish. They're uniformly cheerful, encouraging, and amazed to hear that I'm attempting to do 100 miles. 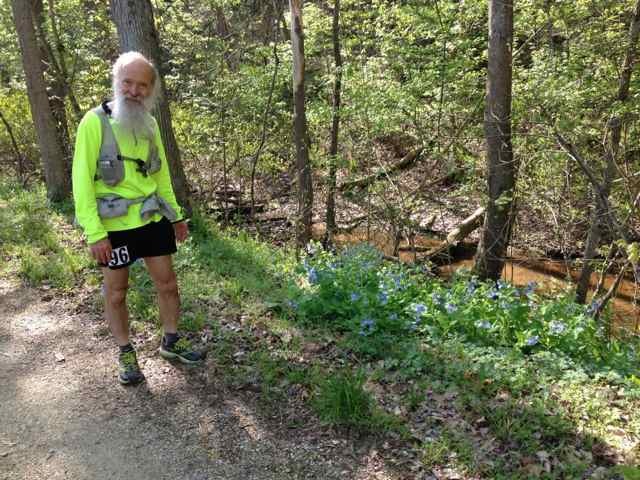 Between miles 35 and 37 an inspirational comment comes to mind: "... the Quit Switch was officially flipped to the off position ...", from Travis Wildeboer's 2013 Barkley Marathons finisher report. Alas, my Quit Switch slips back to "maybe" by mile 40, and then goes to "on" during the final half-dozen miles. That hike in the night is noteworthy for peepers, tree-frogs that shout at me as I pass by. Earlier in the day big turtles sun themselves on sticks in the Canal. My attempts to be mindful and not identify with the pain in my feet — observe it, don't cling to it — are partially successful and probably explain how I managed to complete the final half-dozen miles of my DNF. In the dark I discover that walking in a straight line readjusts fluids in the blisters so that the pain is quite tolerable. But whenever I step on a small rock or turn a slight corner, things get ugly again. The Garmin GPS and Runkeeper track files generally agree; Runkeeper is missing ~20 minutes of data near the ~10 mile point when I inadvertently pause data recording.